When it comes to the outdoor experience, it can be nice to enjoy the fresh open air while also being sheltered from some of the elements. Particularly in the summertime, it is very nice to have a canopy or sun shade to block out the intense sunlight. Not only does this prevent sun blindness, but a sun shade also cools you down to prevent overheating or sunstroke. While some people opt for a custom-built wooden pergola or the like, this can be a costly project, sometimes costing tens of thousands of dollars once labour and materials are factored in. As well, this type of installation is a permanent one that cannot be moved should you change houses. An alternative to a custom-built pergola is a sunshade that you can purchase and assemble yourself in a few hours. Today we review the Palram Palermo 3000 gazebo, which measures in at ten by ten feet, and has a high roof for head room. Its roof panels come together at an apex with ventilation. The panels make for a very beautiful roof that sort of reflect the light and surrounding landscape. This baby is a super chic shade of grey. Its frame is made of heavy-duty aluminum, making it rustproof, sturdy, and durable. It also has galvanized steel connectors so you know this thing is good and strong. The roof panels are composed of polycarbonate that does not discolour or become brittle over time. Instead, the roof panels provide 100% protection from UV damage, and can stand high impacts. This is key! Nothing is more depressing than a faded old patio set. 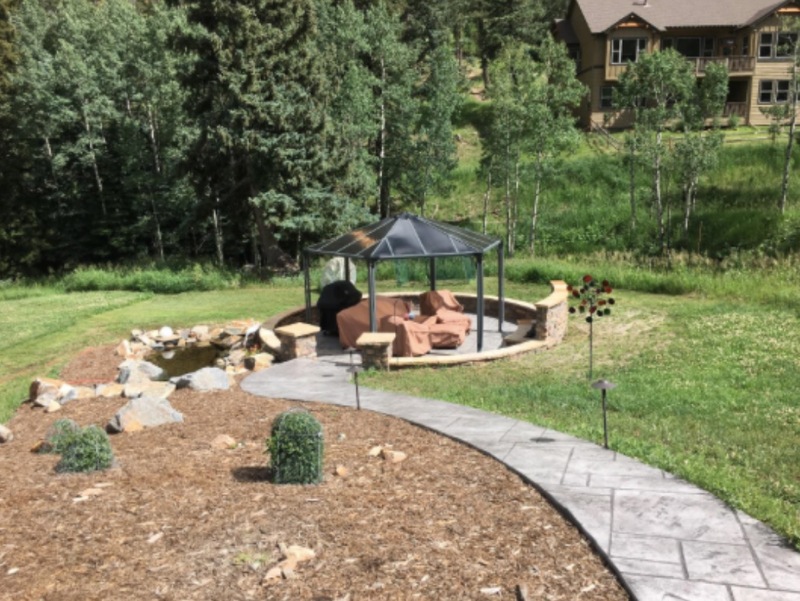 A sunshade like this gazebo can create a focal point to any yard, or provide a designated sitting area away from the regular patio or dining area. What’s more is it doesn’t just block out the sun, but also acts as a rain shelter. Its square shape is a sharp statement when added to any patio or backyard space. This thing is really built to withstand extreme weather. There is no need to take it down for winter. You can leave it up year-round. It can take a beating and still come out looking like new. Another awesome feature is the integrated gutter. This allows water runoff to flow properly, which further protects the overall structure from water-related damage. There is a cupola at the top of the roof, which is designed to let wind through. Not only does this increase air circulation to keep the temperature down, but also provides structural stability as wind goes through the roof rather than under it. This can sometimes cause the canopy to lift so this vent is a very important feature. 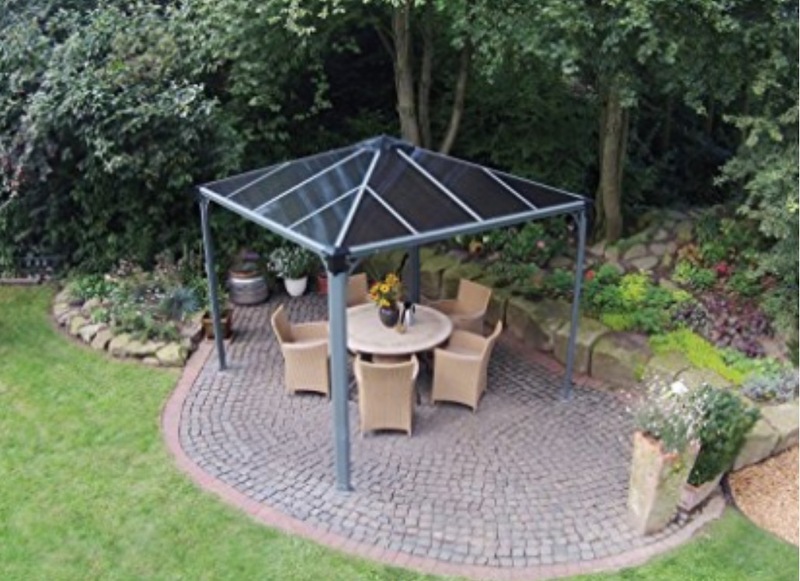 As this model of gazebo is fully weatherproof, you can leave it standing year-round. When you go to winterize your backyard, there is virtually no maintenance to this structure required. The Palram Palermo 3000 gazebo sells for around $1500, which is a very affordable alternative compared to a custom-built gazebo that, while costing thousands and thousands, does not provide full coverage for a deck – the slats would still let the sun in! Not only that, but you’d need to buy a patio umbrella to keep you dry. This gazebo is fully designed to house and protect people and their guests while enjoying quality outdoor time, rain or shine. As mentioned, the integrated gutter helps direct rain away from you and the patio. You will also notice there is a separate track for optional mosquito netting or privacy curtains, in addition to designated hooks. Some simple lace can look quite stunning in the summer months, and can even allow the gazebo to be used for photography backdrops, etc. This gazebo is square, so it looks quite striking atop a hot tub, adding that somethin-somethin by framing the area and inviting guests to enjoy the area. There will be some assembly required upon receiving it; however, it can be done easily with two people. All screws are included, and there is no special equipment required. Before you begin assembly, we recommend separating out all the hardware and marking it, so you know exactly what to do with it. Read the instructions once over so you can plan out the stages. This will save a lot of headache in the future. It will take a good chunk of the day with two people, so plan ahead. You will want to anchor this to your patio to ensure permanent stability. Otherwise, it will blow over, and that would be a silly mistake on your end. Anchoring and footpads are included with the gazebo. It can easily be moved to a new location if you decide to rearrange your backyard. This gazebo has a ten-year warranty, so you can just sit back, relax, and enjoy your shaded hangout spot. No trees necessary!